The restaurant also has the best biscuits north of the Mason-Dixon Line. A few sips into your next rosemary-honey-infused Old Fashioned cocktail ($11), you might look up to find yourself in a thoughtfully updated historic building, seated between a railway man and a rooster. No, you haven’t accidentally downed one too many. And no, you aren’t caught in the set-up to a joke or the trailer to a bizarre buddy-cop movie. You’ve just discovered the dual guardian angels who preside over the front room of the The Buxton Common. 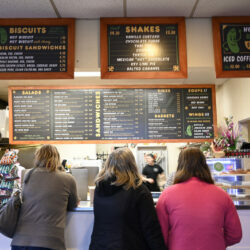 BOTTOM LINE: Before last week, if you had told me that the best biscuits north of the Mason-Dixon Line were in Buxton, I might have laughed at you. But one very solid meal at The Buxton Common later, I’m fully on-board. The kitchen team that chef/owner Max Brody has assembled-from co-kitchen-managers Robert Perry and Kerry Kraker, to pit-and-pasta master Guy Frenette and pastry chef Danielle Henry – is an all-star lineup that pulls off Southern-inspired dishes like Texas-style smoked brisket, Kansas-City-style spare ribs, and yes, unbelievably light biscuits. They also know a thing or two about sauces, which range from delightfully fiery to sweet and creamy. If you visit, be sure to try Tamahl Rahaman’s cocktails: in particular, the Rosemary Old Fashioned and spicy, astringent whiskey-and-ginger-based Wood Shed ($11). Also, don’t skip dessert. Henry’s lush, buttery Triple Coconut Cream pie is worth the trip on its own. With a clientele that consists mainly of families (including plenty of children) and couples on dates, The Buxton Common almost never requires a heavy. On my recent visit to the modern-yet-faithfully renovated Mustard House building, the rowdiest display I witnessed was when a neighboring table let out a tiny shriek upon discovering that their biscuit and cornbread basket ($5) had been cleared while they were in the next room greeting friends. Indeed, that is cause for alarm. Brody, pastry chef Danielle Henry and kitchen manager Kerry Kraker have come up with a phenomenal recipe for Southern-style cat-head biscuits. They’re airy and light, with beautifully unequal layers-like the swollen pages of a book after a summer thunderstorm. No surprise, given that Kraker worked as lead baker at Biddeford’s Biscuits & Company. Whether it’s the water or the egalitarian team of chefs, including co-kitchen-manager Robert Perry, these biscuits are the best I’ve eaten since I lived in North Carolina as a teenager. The bread basket’s Southern touch is no accident; before returning to New England to open his first restaurant, Brody lived across the Southeast and Southwest. 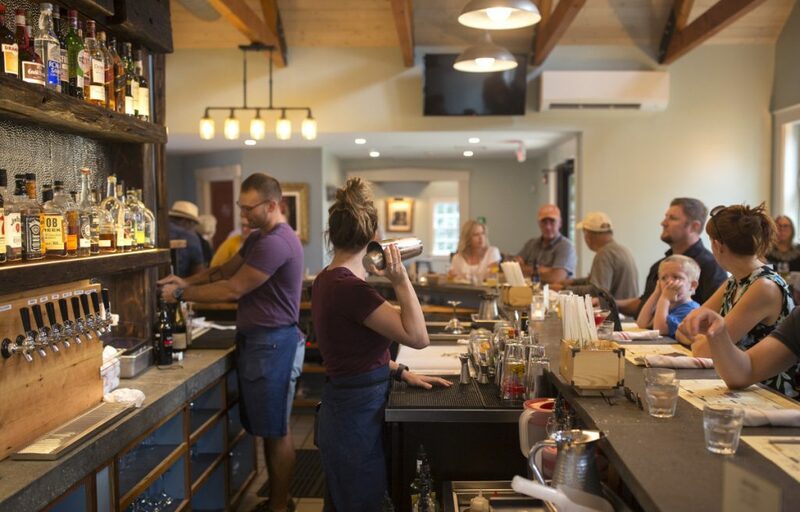 Those experiences reverberate through several menu items, like deviled eggs ($9), which The Buxton Common serves speared with tart, bias-cut slices of pickled okra and shards of pork crackling. It’s a solid dish, let down by the texture of the pork skins, which on my visit, were leathery and sclerotic, not light and bubbly-crisp. 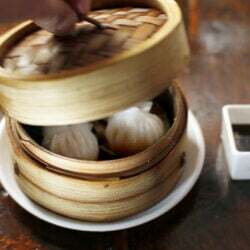 Across the selection of barbecued meats and tofu, it’s also easy to spot references to Southern foodways here and there. As part of a combo tray ($20), I sampled an apple-juice-basted quarter-chicken; a thick tranche of brisket as supple and juicy as anything out of a Texas smokehouse and a quarter-rack of St. Louis-style pork spare ribs with plenty of both bite and toasty bark. Still, Pitmaster Guy Frenette (formerly chef at Artemesia) does manage to squeeze a little Maine into the mix with his Moxie-glazed pork shoulder ($16). 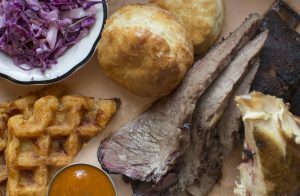 The Combo Tray comes with a piece of chicken, a quarter-pound of brisket, a fourth of a rack of ribs, biscuits, cheddar waffles, coleslaw and slather sauce. But because we’re talking about barbecue, Southern flavors (as well as Western ones) always seem to win out, especially when it comes to sauces. The best among the six options are Slather (a classic, tomato-based Kansas-City-style sauce), ‘Bama White (a sweet, mayo-based sauce with enough black pepper to make a steak au poivre jealous) and Smoked Chile (an agave, garlic and roasted jalapeño concoction that reminded me of the high-octane Hatch Chile sauce I ate spooned onto shreds of sopapilla at Chope’s in La Mesa, New Mexico). I know it wasn’t intended to pair with anything on the smoked fish Fins Board ($14), but I did use a little of that smoky jalapeño sauce to liven up the smoked trout fillet that, despite a lacquered pellicle of Zirbenz pine liqueur, had practically no flavor of its own. Much better were the plump, Cajun-spiced blackened shrimp and the maple-and-bourbon brined, hot-smoked salmon – superb on a ruler-long slice of Henry’s homemade grilled focaccia spread thick with sinus-clearing horseradish cream. It’s hard to overemphasize how much Henry’s baked goods contribute to the experience of eating a meal at The Buxton Common. Perhaps the best evidence is her ridiculously tasty Triple Coconut Cream Pie ($8): a tender, butter crust layered with a salted, coconut-milk dulce de leche, wobbly coconut custard and toasted shreds of desiccated coconut. It rivals anything from the rotating pastry cases of the country’s finest diners and truck stops. There is no higher compliment than that. Frenette’s fresh fettuccine was also pretty special, although its pairing with a flat-tasting smoked-tomato sauce, sautéed zucchini and summer squash, and too much cheese was enough to leave me wishing for something simpler, lighter, and a bit more connected to the flamboyant brightness of the season’s produce. Something like the Bibb lettuce salad ($10), a more robust take on a traditional iceberg wedge. Here, it’s made with verdant Boston lettuce greens sprinkled generously with crumbles of veiny bleu cheese, shards of crisp-crunchy North Country Smokehouse bacon and grilled red onion. “It’s like something almost familiar. 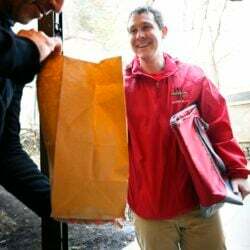 I had it on my last restaurant’s menu in a similar iteration,” Brody told me. 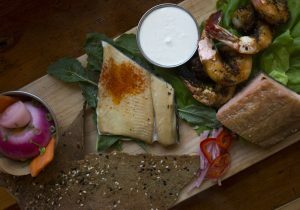 The Fins Board has cured salmon, blackened shrimp, smoked trout, pickled vegetables, lavosh and horseradish sauce. Really, the dressing – a very New England vinaigrette made with malt vinegar and maple syrup – is what makes this dish feel so at home on a Maine menu: barely sweet and practically sparkling with shimmers of acidic tang. You get the feeling that, given a few bites, both the Buxton railway man and the Massachusetts rooster would heartily approve.